You’ve always wanted to visit Paris but you don’t know when you should go? You don’t have a specific time period in mind? Perfect! One of the great things about Paris is that it is a lively city no matter the time of the year, and each season has its own charm. Here, we will take a close look at each month of the year to help you choose when you should come. Let’s begin the year with a good start and enjoy the low tourist season. Since there are fewer visitors, it is one of the best periods of the year to take advantage of low prices in hotels and plane tickets. As for the activities in January, you’ll have lots to do! The beginning of the year means that the Fashion Week is back in town. If you were not invited, like most of us, you can still observe the turmoil of this event in the city. And if you want to compete with some models and celebrities with your fashion sense, in mid-January you can enjoy some great deals thanks to the winter sales. Of course it is cold in Paris in January: the average temperature is 3°c (37°F). At this time of the year, the weather is quite humid and rainy, sometimes snowy. So you should cover up and prepare some waterproof shoes and a raincoat to make your stay a pleasant one. And if you need to warm up a bit, you should visit some museums as they are well-heated during wintertime. 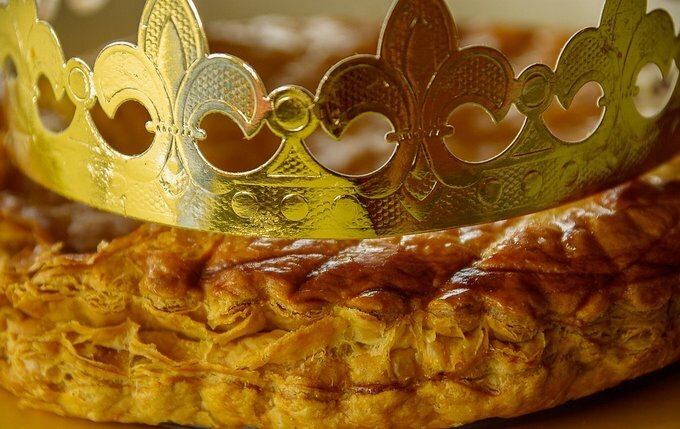 Or, why not stop at a ‘Café’ to taste a warm drink like some good coffee or a hot chocolate with slice of a French King Cake for the Epiphany? Or you can taste (or discover) some French culinary specialties like a ‘Fondue Savoyarde’ or a ‘Raclette’. These dishes are great to fill your stomach up and make you forget how cold it is outside. In February, just like January, you’ll benefit from better prices on hotels, apartment hotels, apartments, and also plane tickets than during summertime. The temperature remains on an average of 2°C (35°F), but at night and early mornings, the temperature is often below 0°C (32°F). It is one of the reasons why during winter you can take walks and visit tourist attractions without being completely surrounded by tourists, contrary to what it’d be like if you went during the peak season. A February trip to Paris is quite a calm and more soothing stay that allows you to visit the city at your own pace. You should not forget that February is the month of Valentine’s Day, and that Paris is the city of lovers. 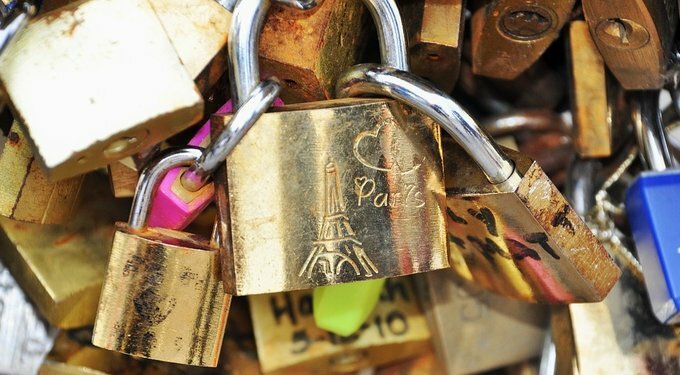 Couples can enjoy the beauty of the ‘City of Lights’, also the great deals offered by many restaurants, and the other events organised for Valentine’s Day. The pastry chefs and confectioners celebrate the lovers’ day too, so don’t hesitate and taste numerous chocolates, sweets, pasties on this day. As for the single ones, families or simply those who don’t celebrate Valentine’s Day, you can just enjoy the small Parisian winter pleasures. 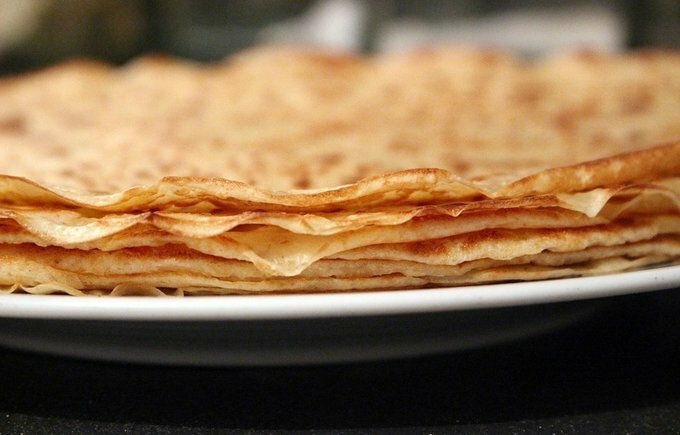 You can eat a pasty while having a cup of coffee at a heated pavement ‘café’ on a cold day, or even celebrate Candlemas on February 2nd by eating ‘crêpes’ with a glass of cider. For those who wish to spend more time outdoor but who want to avoid peak season of tourism, March seems to be a great period to visit the city. 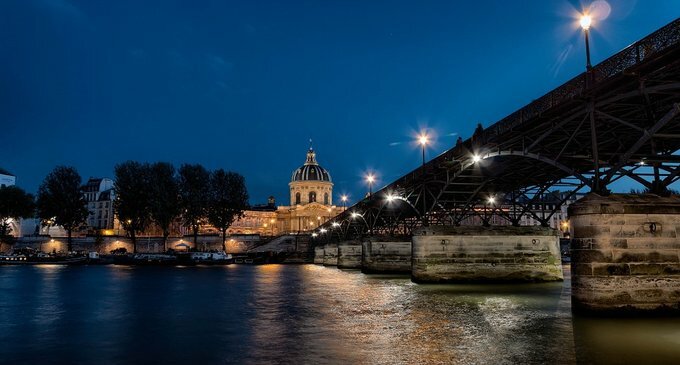 There are a few more tourists than during the previous months, and the prices of accommodations start to rise a little, but it is pleasant to discover Paris at the time when nature flourishes again. The weather (on average 8°C (46°F)) is not summery yet, but it still allows you to participate to some outdoor activities. Some sports events are regularly organised. The running enthusiasts are always pleased with the organization of the Paris Half Marathon in the Bois de Vincennes, which is followed shortly after by the Paris Marathon.And for those don’t enjoy running as much but love to have fun, there is The Color Run! 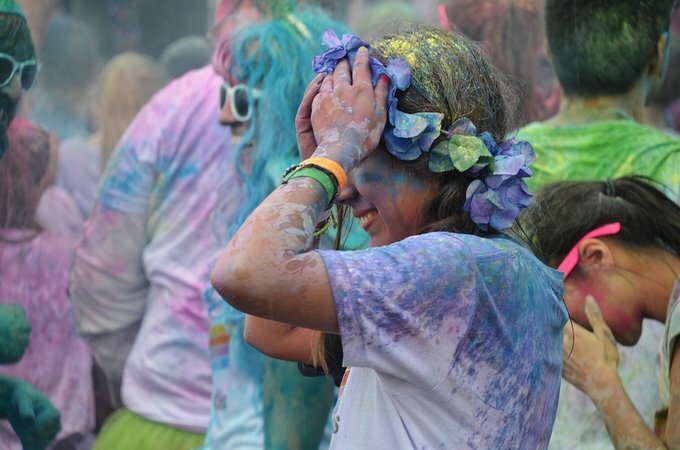 It is a 5km race that will make you run, party and see life in colors. Now that there is no more frost on the roads, it’s time to pick up your bike and exercise while visiting the city (and also you get to avoid taking the Métro). Besides, you can find bikes pretty much everywhere in the city, 24/7 at a reasonable price (5€ the journey the first 30 minutes for free, 1€ for the supplementary 30 minutes, 2€ for the 2 supplementary 30 minutes) thanks to the Vélib’service enforced by the city hall. Why not go for it? For those who think the temperature is still too chilly to hang outside, you should favour inside activities, and at the same time educate yourself and broaden your artistic mind. It is a period where the museums are not full yet, so it’s a great time for cultural visits. Spring is coming! It is time to throw your winter coat back in the closet, take a lighter jacket instead, and get your beanies out of your head. It is now time to discover the outside city! The temperature during April is generally around 10°C (50°F), but you should not rely on this information too much. You should be extra-careful of rapid seasonal weather changes during this time of the year. The weather might be great at the beginning of the month, the temperature even might reach 20°C (68°F), but it’s possible that 2 days later, the weather might resemble the month of February. Therefore, you should plan your trip well, and prepare clothes for each situation possible. As the good days are coming back, what would be better than unwinding in a fair? You should go to the Bois de Vincennes (Métro, porte de Charenton, Line 8) to have fun at La Foire du Trône. 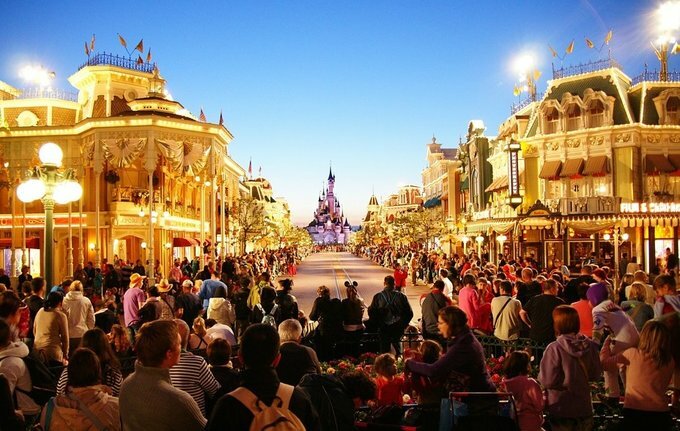 There is find every type of attractions you like whether you are a thrill seeker or not. Or you could simply roam around or organize a picnic in one of the many beautiful parks and gardens of the capital city. You should look out for the magnificent blooming trees, in particular in the Jardins des Plantes (Métro, Gare d’Austerlitz, Line 5 and 10. RER C, Paris – Austerlitz) which has a great variety of different trees, plants and flowers that unveil themselves during spring. Also, for those who love thrills, it’s one of the best periods to visit some amusement parks. Go to Disneyland Paris (RER A Marne-la-Vallée-Chessy)! During April, the weather is much more pleasant than in the winter so you can enjoy the rides without freezing. The park is less crowded than during the summer holidays, Halloween and Christmastime. You can truly enjoy your experience at Walt Disney’s residence. And if you like our Gaul friends better? 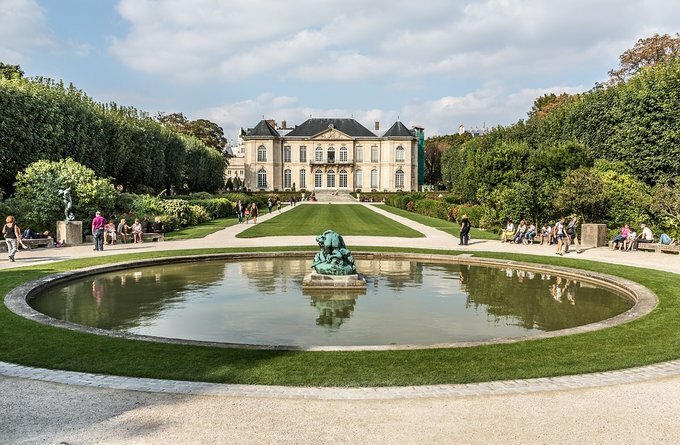 You can always go to the Parc Astérix (accessible by car, by shuttle from Paris (Louvre or Carroussel), or shuttle from the Airport Roissy Charles DE Gaulle (RER B)). Every year, it re-opens its doors in April after its winter break to our greatest pleasure. You will find yourself in the middle of the Gaul village just like it is represented in the French comic book Astérix & Obélix. “En Avril ne te découvre pas d’un fil et en Mai fait ce qu’il te plait” this French saying basically means that in April you should wear warm clothes because the weather is unpredictable, but in May it’s all up to you the way you dress. May in Paris almost means the beginning of summertime. At times you might unexpectedly find yourself in the pouring rain, but still, the temperature is around 20°C (68°F) and even at night it never goes below 10°C (50°F). It is the right time to go out and enjoy the city life (an umbrella in hand, we never know). The peak tourist season is beginning. You should prepare your trip in advance if you wish to visit the “City of Lights”. But it’s definitely worth it because as the summer approaches the atmosphere gets more and more festive. You should go on the upper deck of a tour boat for some sightseeing to discover the many monuments that go along the river, ‘La Seine’. And while you are riding, you can if you want to share a meal with your loved ones while sailing. You might feel like hanging around and chilling in the grass of a park while sharing a picnic with your friends and family. At the Parc Montsouris (Métro Porte d’Orléans Line 4. RER B Cité Universitaire), there is a lake and many different varieties of trees and species birds, and its many statues: the perfect environment for a relaxing afternoon. You should try going to its bandstand where there are free concerts organized from the beginning of May on. 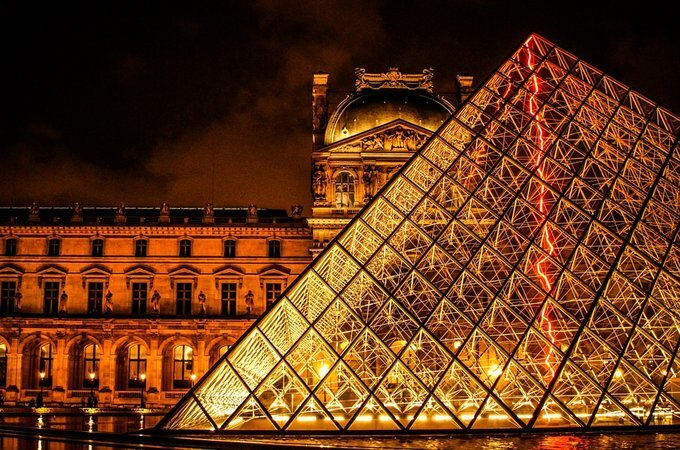 May in Paris is quite peculiar thanks to one particular event: the European Night of Museums. Each year, tourists and Parisians can visit the monuments of the City of Lights by night, and also for free. It will be a great occasion for you to visit the most famous ones or to discover new ones where you won’t have to queue too much. During June the atmosphere of the city is definitely festive. The university students are done with their exams, and the school holidays are right in the corner and everyone can feel it! June also marks the return of the sales which pleases Parisians as well as the visitors that are looking for great deals in the city. There are also a lot of summer activities and events that delight most of us! 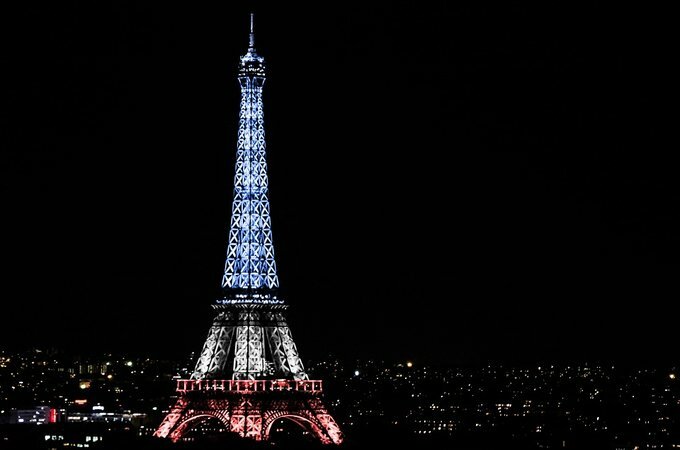 Firstly, there is one of the most awaited sports events each year in Paris. Roland Garros. 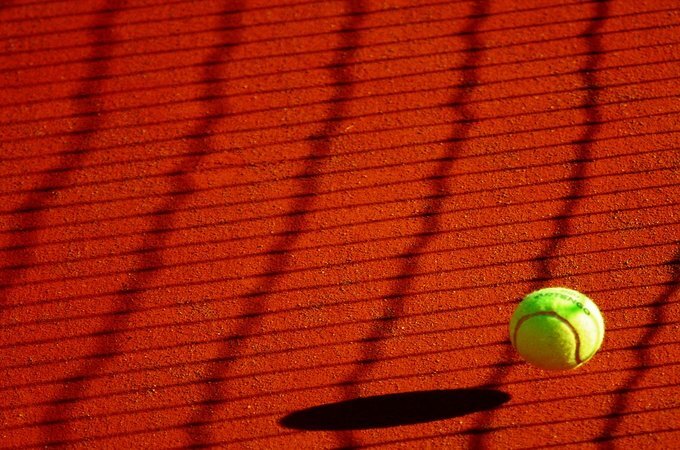 The Grand Slam tournament, attracts several thousands of people fond of tennis from all over the world. Also, for those who like to party, it’s at this time of the year that we celebrate the Tropical Carnival of Paris. As it was too cold to celebrate it in February, we celebrate it now the way it is supposed to. The floats, the costumes and the whole atmosphere of the Caribbeans pay us a visit during the summer for our greatest pleasure. The music fans will also be pleased with all these festivities. There are two huge festivals organized in June. Solidays which is a festival committed in the fight against AIDS. And there is also We Love Green Festival which is an eco-friendly festival. These events get you involved in some useful causes while having fun! However, in June it is the peak season of tourism! So unless you prepared your trip months and months ago, you can have a hard time finding a hotel or plane tickets for a reasonable price. But still, visiting Paris at this moment of the year is worth it! You can fully enjoy the whole summer atmosphere, where the sun sets after 10pm which will leave more time to visit the city. July means that the school holidays are starting for all the French pupils. It also marks a first wave of departure on holidays for Parisians. They start deserting the city whereas there is a mass arrival of tourists. It is a month where the weather is great and the temperature is pleasant in general. It is one of the reasons why Paris is much more visited during the summer and that it’s difficult to find a hotel at a reasonable price. The average temperature is 21°C (70°F), however the temperature drop at times or rise into a heatwave. 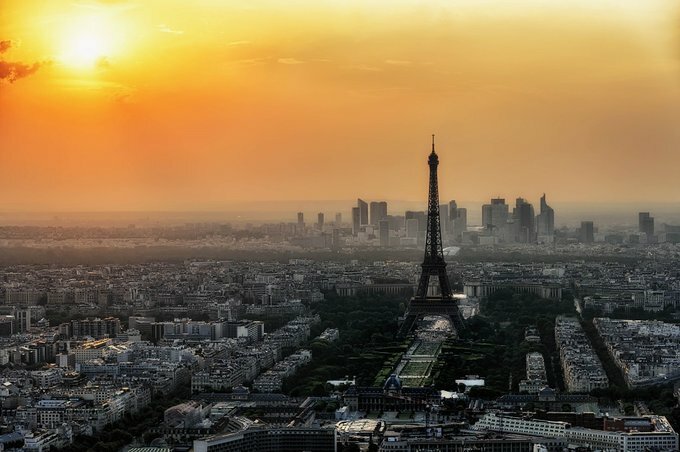 In case you are there during a heatwave, we have to point out that not many places, shops or museums are air conditioned in Paris, so we recommend that you should at least find an accommodation with air conditioning. Also, we have to precise that you have to get up early in the morning for your visits if you don’t want to spend hours queueing to get in (or you should buy your ticket online to reduce the queueing). Anyway, it’s not because Parisians leave the capital city briefly that the city loses its soul and animation. In July, There are plenty of opportunities to celebrate, to have fun and to soothe. Every year on July 14th we celebrate Bastille Day, “La fête nationale.” On that day you can go watch the famous parade on the Avenue des Champs-Elysées. The French President is there to watch the military march and the fighter jets that are flying over Paris, leaving behind them vapor trails with the colors of the French flag. And at night, fireworks enlighten the sky of the city everywhere! To complete this day of celebration you can also go to a Bal des pompiers (Firefighter ball), there are balls in the fire stations in the whole country. 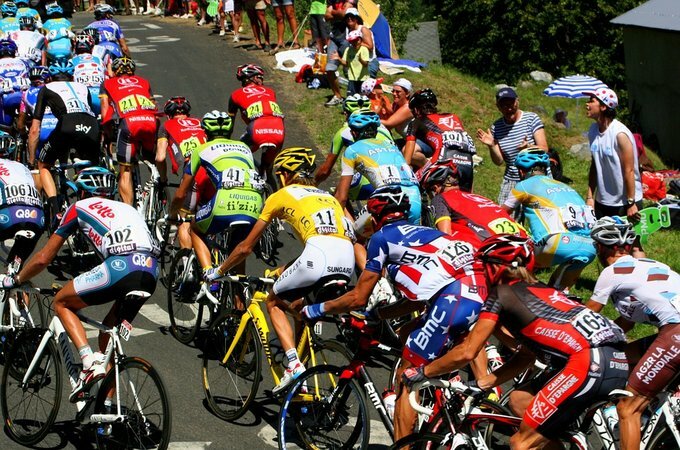 For those who love cycling, July is the month when the Tour de France reaches in Paris. You can go and watch the arrival of the race and also the medal ceremony and the winner taking its place on the podium of one of the most famous cycling race of the world. As for those who like lazing around better, there is more than enough to please you. During July, you can simply sunbathe while enjoying the beauty of great Parisians parks. You can also go to the Parc de la Villette (Métro Porte de Pantin Line 5) to relax after a day of exhausting visits, or even watch a movie there at the Open Air Cinema Festival, all this for free. Or you could go and discover Paris Plages (Paris Beaches). The toes in the sand while sunbathing in a deck chair, the river shore changes during the summer for our greatest pleasure. 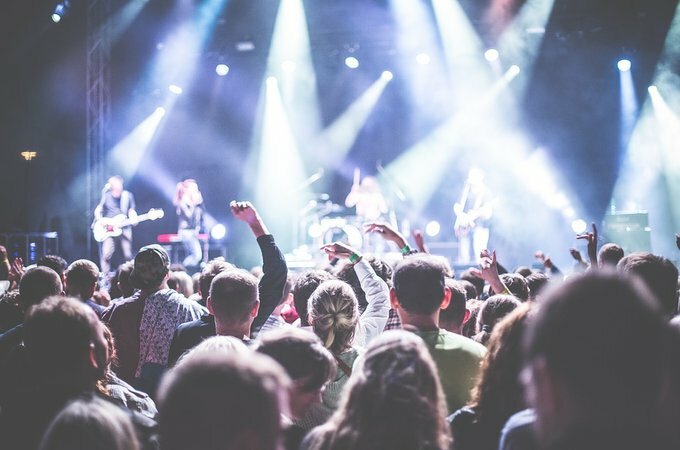 There, there are great summertime activities and small concerts that will let you go with the flow of the festive Parisian atmosphere. For those who don’t mind the heat, it might be a good idea for you to visit Paris in August. The city is still taken over by tourists just like in July (perhaps even more than in July); however, Parisians definitely almost all left the city by then to come back at the end of the month. July and August are quite similar with only a few differences. The weather and the atmosphere are almost the same since all the activities that you could try in July are still all available in August. But although all the touristic activities are full and you could expect every shop to be opened, the smallest boutiques and some restaurants might be closed during this period. But this won’t prevent you from spending great holidays in the capital city since all the major shops remain open all year long. The good thing in August is that there are chances that you might get a great deal on a hotel room. As the businessman who usually stays at hotels leave the city to go on holidays, it is quite common for hotels to do special offers to attract clients during this period. Why not take your chance? However, it might not be the best time of the year for those who is to immerge themselves into Parisian life. But if you feel adventurous enough about the region “Ile-de-France” (literally “Island of France”) and wish to rent a car to visit Paris and its region instead of using public transportation, August is the way to go. August is basically the only month of the Year when we would not dissuade you from renting a car in Paris. Contrary to what’s it’s normally like, the traffic is not bad, we could even say there is almost no traffic (except at the beginning and ending of the month for the departures and returns from holiday); therefore it is way easier to find a parking spot in comparison to the rest of the year. With a bit of luck you will be able to find a car on a comparator like this one for less than €30/day. And if you rent a car, it is the right moment for you to leave the crowds of the capital city and discover something new. 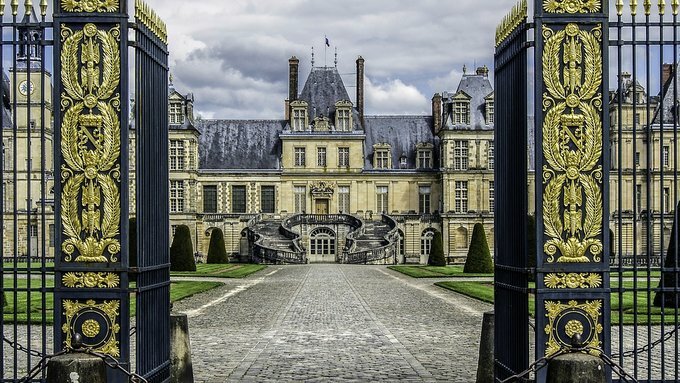 You can go to places of the Parisian Region by car that are not so accessible by public transportation such as the Bois de Fontainebleau or its castle, or even the Fondation Claude Monet and its magnificent garden? It is about time for French students to go back to school, and almost all the Parisians are back home after the summer holidays. The number of tourists starts decreasing bit by bit; however, the prices of hotels are still quite expensive at this moment of the year. The weather in September is still pleasant and the average temperature is about 15°C (60°F). It is a nice period to visit Paris, especially if you can’t take the summer heat. 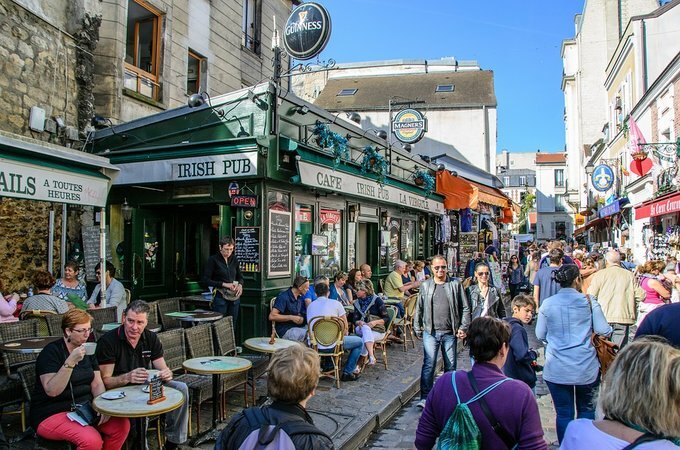 Even though it is cool around that time of the year, you can still stop by a pavement “café” or bar to enjoy a drink. It’s a period when you start to sense the smell of autumn little by little at the same time as you enjoy the last rays of sun of summer. And as the summer activities are over in September, there are other cultural and sports events that will keep you busy. You can go to the European Heritage Days. 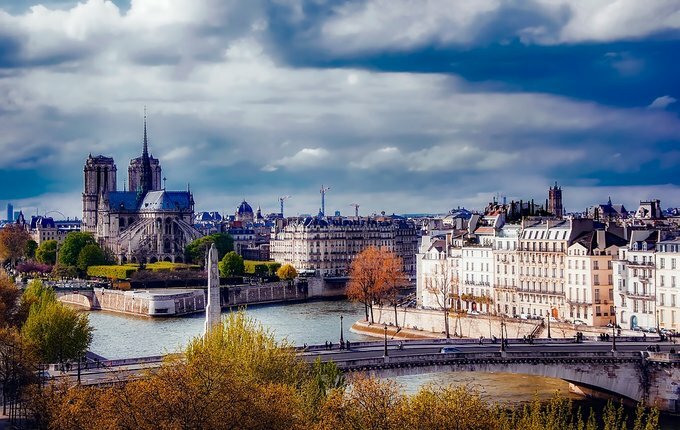 You will be able to discover all the Parisian monuments and more for free, even those which are generally closed to the public like the Palais de l’Elysée or other ministries. For our sportsmen, or rather sportswomen, the race La Parisienne is organized around that time of the year. It is a race that is almost entirely ran by women that was created in order to support the research on breast cancer. In October, we reach the end of the peak season or rather the beginning of the off-season. However, because of the numerous fairs and exhibitions organized, and the omnipresence of businessmen, the prices of hotels and plane tickets remain quite high and difficult to find. The temperature is a bit chillier, around 11°C (52°F), the weather gets more cloudy and uncertain. But this can you still manage to enjoy some rays of sun outside, and you can definitely travel around the city as long as you have a jacket on. During this period the city is way calmer, there are no holidays and less tourists, so you can have a very pleasant experience while you’re staying in the most beautiful city of the world. During September, the beauty of the Parisian autumn is astonishing. As Paris is a green city, it is great to go to a park or a garden to contemplate the colors of fall. The Jardin du Luxembourg (Métro Saint-Sulpice Line 4, Mabillon Line 10. RER B Luxembourg) is located not far from the Latin district. There you can observe the trees showing off their fall color palette. Moreover, if you go there with kids, you can take them to a puppet show, or to one of playgrounds that are designed for them. As for the older ones, they can go and play on chess boards and tennis courts. There are also many cultural events in October. There is another opportunity for you to discover artistic masterpieces by night. 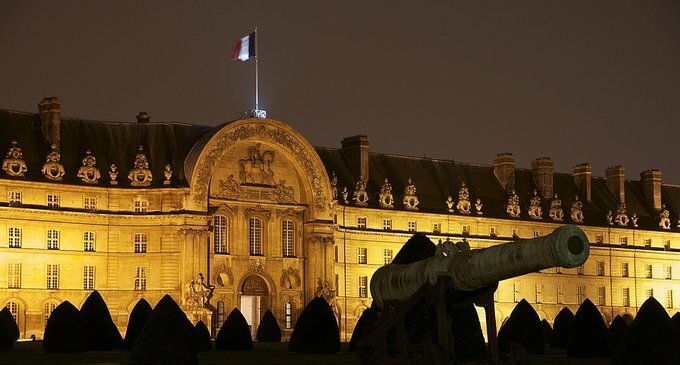 After the European Night of Museums in May, there is in October the Nuit Blanche (All-nighter) in Paris. Artists stay up all night to exhibits their pieces in the whole city. It is a great opportunity to discover some contemporary pieces of artists from all over the world for free. Every single year since the last century, you can come and be part of the Grape Harvest Festival in Montmartre. Each year there is a different theme assigned to the event such as humour or poetry. You will also be welcomed to a ball, some concerts, degustations of some French specialties and fireworks that are organized during the festival. For the ones that are fond of art, the International Contemporary Art Fair, or FIAC, is coming back every year to introduce the latest trends and newest artists of contemporary art. We get closer and closer to the winter and we can spot the few leaves that remain on trees as we are going deeper into fall. It is the off-season and the weather is part of the reason why there is less tourists. The rays of sun are slowly disappearing towards the end of the year, and the average temperature is 6°C (43°F) which is not ideal. However, the prices for hotel rooms and plane tickets are way more attractive at this period than at another moment of the year. So you should not let the weather bring you down, and come visit the city! Even if the climate is quite cold and humid, it is never an extreme coldness. You should cover up a bit and the cold won’t prevent you from discovering the beauty of the city during autumn. It is definitely the best moment of the year to visit Paris’ most famous monuments and museums since there are not many tourists in the city. You can go to whichever place you want without waking up at dawn, without queueing for hours, and without getting stepped on while in the museum. 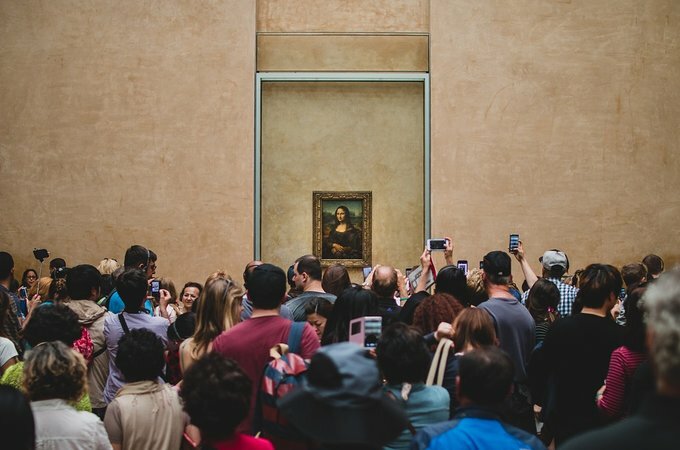 It is a perfect time to go to the Louvre, and you won’t have to wait 15 minutes to just be able to spot Mona Lisa. Later this month, as every year, on the third Thursday of November the Beaujolais Nouveau is back. 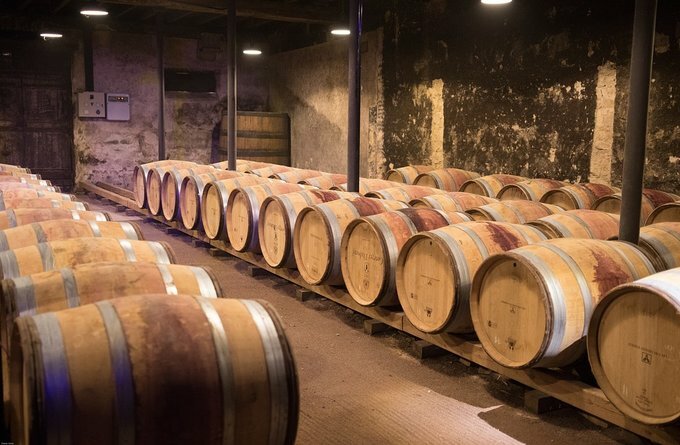 So why don’t you go to a restaurant to taste the new wine of the year? Paris is enlightened and the atmosphere of the holiday season reigns over the capital city. Visiting the city in December makes you live the magic of the holidays in the most beautiful city in the world. The cold is still very present, the average temperature is around 4°C (40°F), and it is often at that time of the year that you can spot the very firsts snowflakes of the winter (even though they tend to melt right away). There are more tourists than during the few previous months, and this is because there are a lot of events organized for the holiday celebrations. The prices for hotels are still quite reasonable except between Christmas and the New Year when the prices rise. As for the plane tickets, they are quite expensive during the whole month. During this month, the days keep getting shorter and shorter and the sun sets around 5pm. But it is actually something positive because thanks to this, you can discover all the Christmas lights set up everywhere in the city during this period. 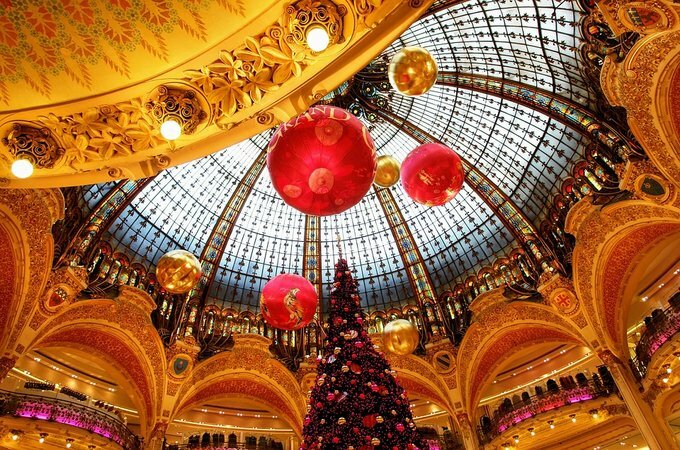 It is also a great opportunity to go and discover the shop windows of the famous department stores of Paris, like the Galeries Lafayette and Printemps which are beautifully decorated for the holidays. You can also go to one of the many Christmas Markets of the city (there are some in Saint-Germain-Des-Prés or near Montparnasse Tower) and their many booths where you can warm up by drinking some Vin Chaud (Warm Wine), or a hot chocolate. It is also a moment where temporary ice rinks are set up at several places of our beautiful city. You can go ice skating at the 1st floor of the Eiffel Tower, and there is another one at the AccordHotels Arena. 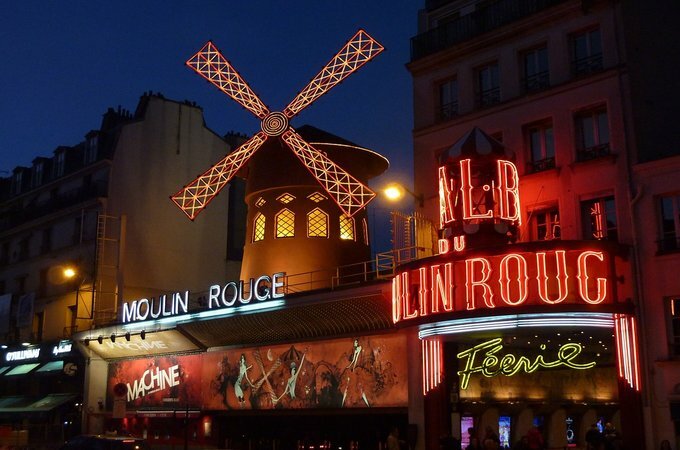 The year-end holidays in Paris rhyme with lots of spectacles, and this is why the most famous cabarets of the city, the Lido, the Moulin Rouge and the Crazy Horse, celebrate the holidays in a magnificent manner. And now that you know when to visit Paris, check our article on the price of living in this city !